In July 2005 NewcastleGateshead hosted a leg of the Tall Ships Race for the third time. This event is hugely popular with local people and a major tourist attraction, with the added bonus that in 2005 it formed part of the Trafalgar/ Year of the Sea anniversary celebrations. 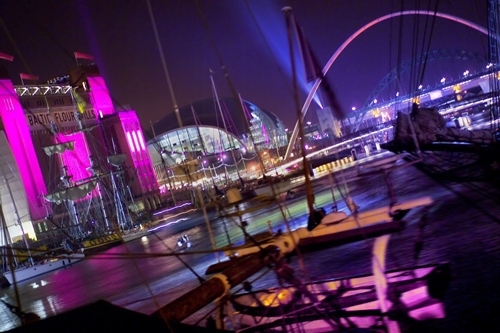 For 3 days the Tyne hosted over 100 sailing ships including some of the largest sail training ships in the world. The biggest single event in this period is the Eve of Parade of Sail on the evening before the tall ships moved back down the Tyne to start the next leg of the race. The brief from the two host councils was to create an eve of parade of sail event that would move beyond a simple firework display to create something unique to NewcastleGateshead that would set a benchmark for future eve of sail events. A budget of £275,000 was set and the event was tendered (in two stages) with EI’s bid proving successful. The event created, “Cresting the Waves” sought to reflect the vitality of the city and the optimism and achievement of the tall ships’ crews, which are largely made up of volunteers under the age of 25 who have no previous experience of sailing. The show created the next morning’s activities – preparations for the race, the journey down the Tyne and the race start on the open seas – as a piece of theatre. 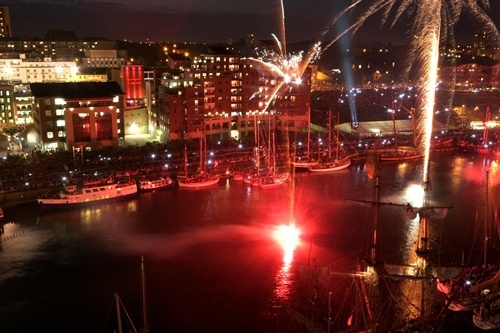 The main elements of the show were large-scale lighting and film projection on the Tyne’s landmark buildings, specially commissioned music (delivered by a line array system along the river), aerial performers on the Baltic Gallery and some of the tall ships, and pyrotechnic effects fired from pontoons along the river, buildings and a single site for large-scale air burst effects. From a staging point of view the challenge was creating a single experience for the audience along the 2.4 km of the Tyne where the tall ships were berthed. The show was watched by a single audience estimated at between 150,000 and 250,000 people. The event was stunningly successful with audience and media and Sail Training International, who have organised Tall Ships races for more than 20 years, described the show as the best eve of parade of sail event they had ever witnessed. Needles to say the client was very satisfied!